BuffTuff® Plus™ - Back shaft section made with BuffTuff Plus carbon weave construction, which provides consistent spine consistency, strength and durability. 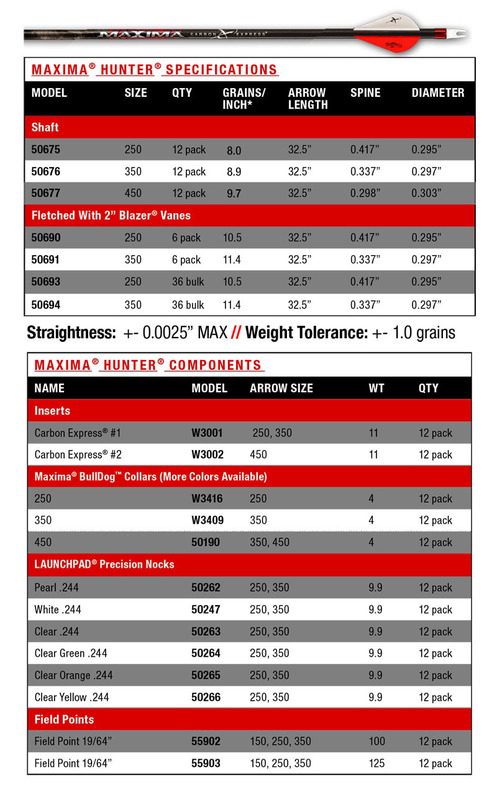 Matched Set™ - All Maxima Hunter 6- and 12-pack sets are sorted and matched by weight and spine for best-in-class consistency. Spine selection sorting tolerance is +/- 0.0025". Weight sorting tolerance is +/- 1.0 grains. Real Straightness™ - Every Maxima Hunter arrow is laser checked for straightness to a remarkable 1/10,000 of an inch. Maxima Hunter straightness of +/- 0.0025" is a maximum measurement, not an average. The Maxima Hunter® combines heritage with the added benefits that result from proprietary Dual Spine Weight Forward® technology. The precision design delivers tighter tolerances than traditional carbon arrows. Dual Spine Weight Forward Proprietary fusion of different carbon materials that create 2 spines in 1 arrow to manage energy better and make arrows recover faster, spin 20% sooner, retain more speed and deliver unparalleled accuracy.